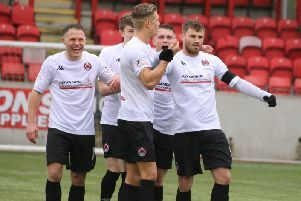 A proud Clyde performance secured a Scottish Cup replay with Ayr United after a 1-1 draw at Somerset Park. David Gormley gave the Bully Wee the lead on 55 minutes with Ayr equalising through Paul Cairney on 69 minutes. Ayr started strongly and Gary Harkins created a decent chance for himself in the third minute, only to be denied by man of the match Connor Quinn. The keeper only joined the club on Friday afternoon and wasted no time making an impact. He denied Declan McDaid twice, first getting a good glove on a curling effort, before making himself big to deny the Ayr winger from close range. Craig McGuffie was the next to be foiled by the 18-year-old, before Nicky Devlin’s deflected shot from 30 yards hit both posts and stayed out. McDaid found himself one-on-one with Quinn shortly before half-time but the keeper again came out on top with a great stop. Barry Ferguson’s side had chances of their own in the first half, the best a Scott McLaughlin free-kick which was blocked. After the break Clyde came out and dominated proceedings for 10 minutes, culminating in Gormley slotting home after Scott Ferguson played him in. The 450-strong visiting support were nearly celebrating another goal on 67 minutes when Sean Higgins’ 30 yard strike hit the base of the left-hand post. Two minutes later, the Honest Men were level. Clyde failed to deal with a corner into the six yard box and Paul Cairney capitalised, knocking home from the centre of the area. Clyde fought hard after conceding, and limited their hosts to only a couple of chances in the last 20 minutes. Darryl Meggat headed over from a corner on and Quinn produced perhaps his save of the day to deny Cairney a second in the 89th minute, leaping to his left and tipping a fierce shot wide for a corner. The replay takes place at Broadwood on Tuesday night with the winners away to Hearts or Hibs in the quarter-finals.